We are all born, we all live, we all die. It's a simple journey, but one fraught with potential difficulties, that are made simpler by our need to rely on each other. That reliance begins when we are babies. We are born so helpless, we all need the care of parents twenty four hours a day to survive. For the majority, the need for physical care reduces over the years, and by the time we leave home, our reliance on family is mainly emotional, and practical. By then, if we are lucky, we have developed self reliance, independence, an ability to get along in the world. But we never lose the need for friendship and family: the people with whom we share our joys, hopes, aspirations, the people who we still rely on in our darkest hours. For some, full self-reliance is never possible. Some are born with a disability/disabilities or chronic illness that means they will need physical and emotional support throughout life. All of us face the chance that we might become sick or disabled in later life, requiring major life changes and a recognition that things will be different from here on. But that doesn't mean life can't be lived to the full. With the right supports from friends and family, with the right amount of state funding they can be in control of, people who are sick or disabled live important, creative lives, full of hope and possibility. And, of course, all of us, no matter how healthy and independent we are in our youth and middle years, there will come to a point where we begin to fade. Gradually we will find our joints aren't as flexible. We will suffer minor health crises that become major ones. We will learn to become more dependant on family and friends as we lose the ability to drive, to cook, to walk. Yet, even then, life is precious. If we have support and are surrounded by those who love us, we can still find pleasure in the simple things - listening to music on the radio, watching grandchildren play in the garden, a visit from an old friend. With the right resources, a good life is always possible - even in the most adverse circumstances - as Sue Marsh articulates so clearly here. And yet, there will come a point for all of us when the pain, the loss of independence, the indignity, the sheer hard grind of it all becomes too much. What should we do then? How is life possible in such circumstances? Should it be allowed to continue in such circumstances? The Right to Die movement believes that it shouldn't, that in the final moments, we all should have the choice of when we leave this world and that our families and friends should be able to help us without impunity. I know many good people who believe in this campaign, and believe we need to legislate for legalised assisted suicide. I have some sympathy with their views - none of us want to face indignity at the end, none of us want to be a burden to family and friends, and if someone we love begs for help to die, wouldn't we be hard hearted to respond? I would never want to condemn someone who makes that choice, or someone who helps a friend or family member make that choice. And I don't believe justice is served by punishing those who help people they love in this way. But I can't support it being made into law, partly because I believe that end of life would be improved for everyone if the kind of care available in hospices was normal. Partly because I think the legal guidance as it stands, makes it possible for people who disagree with me to undertake assisted suicide even though they are technically breaking the law. And partly I can't support the legalisation of euthanasia because of the possible unintended consequences, particularly at the moment. Because, no matter how good the intent, no matter how many guarantees may be in place, once the state says it is legal to carry out assisted suicide, it becomes easier for the state to intervene in other situations. Right now, that's a very scary prospect for people with disabilities, chronic illnesses and their allies. The era of austerity has resulted in an unprecedented rise in hostility to disabled people, the highest rates of disabled hate crime recorded and as disabled and sick people struggling to survive as they bear the brunt of the cuts. When Colin Brewer, a Cornwall Councillor said disabled children should be put down because they cost too much it was good to see that he was condemned. However, he is not alone, Geoffrey Clark, a UKIP candidate has expressed similar views, and how many more agree in private? No wonder Baroness Campbell told the House of Lords earlier this year in a debate on assisted suicide this is a dangerous time to consider legalising euthanasia. The shadow of the Nazis T4 programme still hangs over disabled and sick people - and sadly, I no longer believe it could never happen here. It doesn't have to though. If enough of us work together to make sure the rights of sick and disabled people are always at the forefront of society. If enough of us, work together to ensure everyone who requires support gets it. If enough of us recognise that we all rely on each other to survive. Because everyone has the right to life. And everyone has the capacity to live the fullest life possible. All it takes is a little bit of support. My last fast proved remarkably easy, in that I didn't feel too hungry most of the day, and the last few hours didn't feel like a countdown for once. There were however, several moments when I felt low and close to tears, as I had done previously, which confirms for me that going without food is not good for anyone. Friday's fast was in memory of Karen Sherlock, another person who suffered from the horrors of the work capability assessment. I've written about Karen before because although I never met her, we spoke several times on social media, and she was keen to share her story with the Atos Stories project. Like many, I followed her fight to be placed in the support group where she could claim Employment Support Allowance without being put under pressure. And like many I was horrified that any system could be so inhumane to find a person needing regular dialysis with multiple health problems, fit for work. I was further horrified to discover that Karen was also the victim of a particular piece of cruelty of the welfare reform act, losing her ESA because she'd been placed in work related activity for a year. So I was delighted by her announcement that she'd finally won her battle. Sadly, Karen died less than a fortnight later; another person whose last months had been made more stressful by the Work Capability Assessment process. Another person struggling for the right to have enough money to live not comfortably, but sufficient for her needs. Another person whose complex mix of conditions - diabetes, heart, kidney problems - meant having enough money to buy the right food was so important. Karen's story is unfortunately not an isolated one; and whilst disabled and sick people are bearing the brunt of the food crisis, so too are families on low incomes and benefits. I took part in End Hunger Fast to help raise awareness of Karen and all the people like her who struggle for the right to have a basic income sufficient for their needs. A struggle that would be unnecessary if politicians had stopped and listened to the many voices raised in protest as the Welfare Reform Act was forced through Parliament two years ago. A struggle that could be over if politicians started listening now. They could start by listening to the voices of disabled people reflected in the new "Beyond the Barriers" report published last week by the Spartacus network, which clearly sets out how providing the right support for people is not only the right thing to do morally, but also economically and brings value to the taxpayer. They could listen to the voices of the Trussell Trust who today published figures demonstrating a 163% rise in the numbers of people using foodbanks this year. They could listen to the End Hunger Fast campaigners who have fasted in so many ways this Lent and who will be vigilling outside Parliament tonight as the fast comes to an end. Most of all they could take heed of the message behind the "Beyond the Barriers" report - "Work for those who can. Security for those who can’t. Support for all" - because that is what a decent society should look like. Keith and Simon finished their phenomenal 40 day fast at the weekend, Scott finishes his today. If you're in London today you can join the End Hunger Fast vigil at Old Palace Yard, Westminster, at 6pm. I have to admit I was sort of looking forward to this fast as it is always much easier to do something difficult when you are joining thousands of people who think and believe as you do. I'd also foolishly anticipated my fifth fast wouldn't be so hard, as each week has become progressively easier. However, it didn't turn out like that - yesterday was as demanding as the very first fast I made on Ash Wednesday. I'm not quite sure why - it might be down to my life being quite stressful at the moment; or that I hadn't recovered from a 5hr round trip on Mother's Day; or that I had one too many glasses of white wine the night before. Whatever the reason, I woke up with a raging headache and nausea interspersed with strong hunger pains. And though it was a boost to see so many people on Facebook and Twitter posting pictures of their empty bowls and plates, I left for work feeling weak and feeble. It didn't get much better during the day. We'd agreed to provide lunch for some guests, so I spent an hour in a meeting where everyone else was eating apart from me. This was followed by a bring and share lunch for a highly respected colleague who was retiring. I couldn't not go, but watching others eat, smelling the delicious food was challenging to say the least. By the time I got home, I was faint with hunger, which was the point when I realised that I'd not taken the vegetable stock drink I normally have. (It's my remedy for recovering from tummy bugs, as it provides the illusion of eating and injects a bit of salt in the body). That seemed to help a bit, as did checking in the National Day of Fasting Facebook page and catching up with others who were definitely feeling the same or worse. I normally find the last few hours of the fast the hardest, but they were made easier this week by me having a busy evening. My son was lighting a stage show so needed dropping off, after which it was time for prayers in Church. Each week through Lent, our parish comes together to meditate on the Stations of the Cross - the stages of Jesus' journey to death - followed by silent prayer. This week the hour of prayer was for all those who go hungry - the bags of food in the food-bank box a reminder of the food poverty in our local community. It's been a while since I've done Stations of the Cross, and the simple meditation by Pope Francis, was both a powerful prayer, and a reminder to me that Jesus through his life and death continually calls us to act with justice. I left early to head down to Pegasus Theatre to see the show my son was lighting. "Stories for Survival" was an ambitious piece of theatre by anyone's standards - a re-working of "The Arabian Nights" through drama, dance and music, reflecting on violence, forgiveness, political repression, and the struggle for refugees to survive. What was most impressive was that the performers, composers, stage designers, technical crew were all young people. It was wonderful to see their commitment to the work and I found it particularly poignant, in a week when 18 year old Yashika Bageerathi was forcibly deported in brutal circumstances, a victim of anti immigrant scaremongering, despite the brilliant campaigning of her class mates. "Stories for Survival" also seems an apposite title for many people in this country today. The people who are living hand to mouth on zero hours contracts that never guarantee a steady income. The people who live on just above the minimum wage, struggling to get by. Those whose housing benefit has been capped, so ends never meet however far they stretch them. The people who are the recipients of the thousand and one cuts of that cruellest of acts, the 2012 Welfare Reform Act. So many struggling to survive with dignity and respect, whilst the rich get richer, politicians turn their backs and the media denigrates them. "It has come to my attention that while many of my friends and I were at the funeral of our good friend Paul Reekie, aged 48, it would appear that you were giving a speech in Parliament announcing your intentions to slash the benefits paid to the poorest and most vulnerable in our society. "I thought I would let you know that Paul took his own life. He didn't leave a note but he laid out two letters on his table. One was notifying him that his housing benefit had been stopped. The other was notifying him that his incapacity benefit had been stopped. "The reason I'm writing this letter is just so you know the human cost of attacking those on benefits." Sadly George ignored him. For the last four years, he has promoted a economic policy driven by the myth that the welfare state is too expensive, and needs to be cut in order to reduce the deficit. He continues to ignore too, that the policy is not only inhumane, it's not working. Since the Coalition Government has come into power the national debt has increased not decreased . And yet the cuts keep coming, and human cost will continue to rise as a result. All of which is why End Hunger Fast matters as a campaign, and why we need to keep campaigning when the fasting is done.This week the All Parliamentary Party Group on Hunger and Food Poverty launched an inquiry into the growth of food banks, attended by our very own Keith Hebden. Despite some crass comments from one Tory MP, the fact the committee recognises the importance of researching food poverty is an important step in changing hearts and minds in Parliament. A little sign of hope that we're beginning to make a difference. And a sign that we shouldn't let up. The National Day of Fasting may be over, but Keith Hebden, Simon Cross and Scott Albrecht are still at it. Their forty day fast will continue till Palm Sunday (13th April 2014). You can help by cheering them on via social media, by telling as many people as you can about their witness and by taking action as recommended on the End Hunger Fast website. And keep on acting once Lent is over. For - as End Hunger Fast say on their website - food poverty is a national and moral crisis. It is time we made sure politicians on all sides of the political spectrum started paying attention to this crisis. In 2010, buoyed by a sense that the public wanted economic stability, George Osborne could ignore the warning of Paul Reekie's death, and declare austerity was the only solution to the financial crisis. Let's make 2014 the year the human cost of the cuts becomes clear to the nation. The year public opinion begins to change on welfare. The year politicians disregard this moral crisis at their peril. End Hunger Fast - Week 4. This week was my fourth fast for End Hunger Fast, which, felt in some ways easier than others. I had hunger pangs in the morning, and for the last hour, but for most of the day found myself not thinking too much about food. I did, however, feel quite mentally weak; particularly because my day began with a pretty stressful work issue that almost had me in tears before I reached the office. All of which leads me to conclude that most people can get used to anything - if you go hungry often, your body is likely to adjust- but in the long term it's never going to be good for your physical and emotional well being. For yesterday's fast I chose to remember a man who is only known to campaigners as George from Chesterfield due to this article in 2011. I remembered George, because it is his story that brought Atos and the Work Capability Assessment to my attention, kick-starting the Atos Stories project. Despite having a heart condition, angina and regular chest pain, Atos found him fit to work, requiring him to be placed on Job Seeker's Allowance and look for a job. Eight months later he won his appeal and was placed in the work related activity group, enabling him to claim Employment Support Allowance. But due to the constant reassessment required by the DWP, he was soon called in for another medical. He died of a heart attack the day before he was due to attend, his widow convinced the stress killed him. George did not die of hunger; unlike some of the people I have been remembering in my fasts, his cupboards weren't totally bare. But, even on £90/week and whatever income his wife brought in, it is likely that food was a struggle. And the fear of that benefit being reduced by £30/week - a significant reduction for a low income family that would surely have added pressure to their budget - must have contributed to the stress that was a factor in his death. Since I read George's story, I've lost count of the amount of people who have died from Atos-induced stress, hunger, or fear. Not surprisingly really, the DWP's own figures (before they stopped producing them) suggested that 32 people were dying each week after being placed in work related activity group. It's a national scandal, which is now firmly in the public eye thanks to the brilliant campaigning of Black Triangle, Disabled People Against Cuts, Kaliya Franklin, Sue Marsh and others. In fact the WCA has become so toxic that Atos finally pulled out of the contract this week. Of course that won't stop the cruelty and chaos of the scheme, but it is a start. And a start is what we need; because despite the progress we've made in campaigning on welfare issues, we've a long way to go. This week, for the first time ever the House of Commons, voted to cap welfare. A move initiated by the government, and disgracefully supported by Labour. By their own admission, this was less about ideology and more about playing politics. According to my MP's response to my request he rebel, Labour seems prouder of not falling into the Daily Mail trap they believe Osborne had set up for them, then their lack of positive alternatives to welfare austerity. Sadly, the party that set up the welfare state is still too scared to articulate the strong moral argument for a social security system that takes care of those in need. I can see that they believe appealing to the middle is the only way they're going to win the next election, but we aren't going to end hunger that way. And judging from the latest opinion polls pandering to the right isn't doing them much good either. For too many years politicians on all sides, have continued to promote the lie that the welfare system is a burden on the taxpayer. A lie that has led to a situation of such dire food poverty that 500,000 people sought the help of food banks last year, whilst 5,500 people were admitted to hospital for malnutrition. If we are to make a change from the toxic politics of WCA, workfare, sanctions, bedroom tax that have caused this mass hunger, it is time we had a changed narrative. One that restores a belief in social security for everyone who loses their job, becomes sick, or ends up a single parent. One that says that in a rich nation, no child should starve, no disabled or sick person should live in fear of medical assessment, no adult should be anxious about how to pay their bills. Labour, as the main opposition party, is in the perfect position to shape this narrative, yet it cowers in the corner too afraid to speak out. If we want real change in this country it is high time that Labour stops playing politics, ditches its neoliberal shadow chancellor and develops some real balls. I happened to be in London on Thursday morning, in time to see Tony Benn's funeral cortege. It was moving to see how much he meant to so many, how his commitment to social justice had such an impact. Among the many banners on display, one jumped out at me. It said something to the effect that Benn stood up for the poor, the discriminated against; he was on the side of the people. I hope Ed Miliband and his team saw that sign when he went into church. I hope they recognised that the affection felt for Benn was due to his moral stance on so many issues, and his willingness to speak the truth even when it made him unpopular. And I hope they can begin to see that the only way out of the mess this country is in, is if they stop being scared, and become a party of the people once more. A party that places justice before politics, principle before media sound-bites, and acts on behalf of those most in need. This week Keith Hebden, Scott Albrecht and Simon Cross passed the halfway point of their 40 day fast for End Hunger Fast. On Friday they are inviting us all to join them as part of a national day of fasting. I'll be fasting for the fifth time, remembering another welfare victim as I do. If it's at all possible, please consider joining us if you can. Eighteen months after that budget, Helen and Mark Mullins took their lives after struggling to live on £57.50 a week. The reason for their limited income cannot be laid wholly at the coalition's door. They were trapped in a Kafkaesque situation where Helen was deemed not fit to work and therefore unable to claim JSA, but lacked a medical diagnosis for her learning disabilities that would have enabled her to claim incapacity benefit. Helen should have been offered support from Social Services, but somehow fell through the net. Given that all political parties apart from the Greens are wedded to austerity budgets, it is quite possible they'd have had the same experience under a Labour government and made the same choice to die. However, one thing that can't be disputed is that Helen and Mark were victims of an increasingly punitive approach to people claiming benefits. An approach begun by Thatcher, perpetuated by new Labour and accelerated by Cameron, Osborne and Duncan Smith. Nor can it be disputed that Osborne's approach to cutting the deficit is the most vicious of any Chancellor, hitting sick and disabled people more than any other groups in society. It is also clear that the cause of their suicide - no longer being able to cope with living off a few vegetables donated by the soup kitchen as they huddled for warmth in one room - has become more common place in the last four years. I spent my day's fast thinking of Mark and Helen, praying as I did so that this year we had a budget with humanity, a budget that recognised the impact of cuts on the poor, a budget that would end hunger today. Unfortunately my prayer was not answered. Instead I was forced to listen to George Osborne boasting of his economic achievements (a tiny recovery spun as growth, a deficit that has increased since 2010). As the evening progressed, I became increasingly angry, the sick feeling in my stomach, partly due to hunger and partly due to disgust at his refusal to acknowledge the needs of the country. The most depressing moment of all was realising that the proposal to cap the benefits bill, was not only going to be made into primary legislation to ensure it continues for the next four years, but will be supported by Labour. In other words, when the money for welfare runs out, as it undoubtedly will, there will be more no more left for those in need. So we will see more queues at the foodbanks, more people go hungry, more suicides, whilst wealthy politicians on all sides of the house stand by and let it happen. As with last week, the last couple hours of my fast were difficult; I was hungry, I felt sick and I was raging. And then something rather wonderful happened. Grant Shapps tweeted what must rank as one of the most crass political messages ever, celebrating the cut in tax duty "to help hardworking people do more of the things they enjoy." After a quick check that it wasn't a spoof, Twitter and Facebook was soon full of hilarious parody versions (this was my particular favourite). Suddenly, angry and sick as I was, I began to laugh and laughing felt good. Because four years ago, when I commented on the BBC website, I felt isolated and alone, drowned out by waves of people celebrating attacks on the workshy. 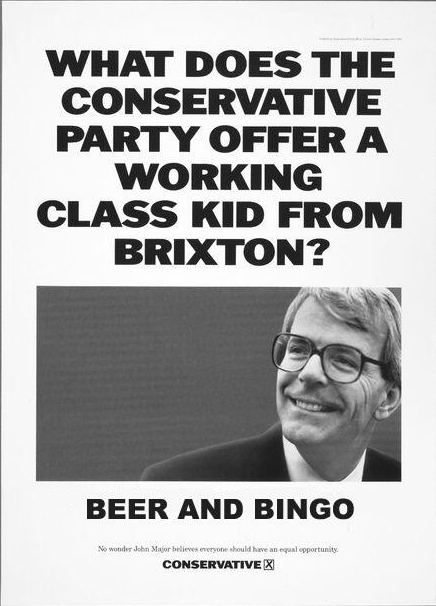 On Wednesday "Torybingo" made me realise that, despite the lies of this government, the majority of people know exactly what we are up against. And that's more than a little encouraging. In the mean time, we can keep doing all we can to raise awareness of these issues. Keith, Simon and Scott are on day 18 of their fast, nearly half way through. I'll be fasting again next week, and everyone is invited to join in the National Day of Fasting on 4th April. So please help us, by fasting if you can, and if you can't, please help by spreading the word. Together we can End Hunger Fast. When I was in my mid-twenties, I experienced a period of uncertain employment and very low wages. It happened to coincide with interest rates rising to a staggering 15% that doubled my mortgage within months and left me struggling to pay the bills. I was fortunate to have enough emotional resilience to pull myself through a difficult time, and a strong network of family and friends to help me out when the going got really tough. Nevertheless, I spent over a year with my outgoings exceeding my income - not because I was profligate - but because I just wasn't earning enough to cater for my basic needs. It wasn't poverty, but it was close and for a long time I teetered on the brink. It was a life of difficult choices - did I pay the electricity bill or let it go red so I could stock up my meagre food cupboard? Did I buy a travel-card, or cycle the 18 mile round trip to work so I had enough to pay the mortgage? When I eventually landed a job that set me back on track, the debts I incurred took five years to clear, and I was on the credit blacklist for even longer. I'm grateful for that experience, difficult as it was, for giving me a small insight into the precariousness of life at the bottom end of the salary scale. It's easy when you live comfortably, as we do now, to forget that not everyone is as well off as us. And I guess, the really wealthy - like the coalition ministers who are making decisions about welfare cuts - are so far removed from that life that it is either beyond their imagination, or they just don't care. Either way, they seem to have no understanding of the impact of their policies and the way they affect ordinary people such as Stephanie Bottrill. Stephanie lived with the condition, mysasthenia gravis, an auto-immune disease that weakened the muscles, and required constant medication. In the past, this country recognised that people like Stephanie need support to survive, but under this coalition government, disabled and sick people are bearing the brunt of austerity cuts. Stephanie was one of thousands charged with the bedroom tax, an extra financial demand she simply couldn't afford. In the last few months of her life, she couldn't afford to heat her home, and was cutting back on food so much, all she had in the cupboard was tinned custard. Her life was so desperate, she walked in front of a lorry on the M6; another unnecessary welfare death made even poignant by the news that she should have actually been exempt. David Cameron recently reminded us that Britain is a wealthy country, and that money should be no object when faced with the terrible consequences of flooding. A comment that puts the lie to the rhetoric of the last four years that austerity is necessary, that cuts are necessary and that welfare reform is necessary. It is time that he and his government step out from their comfortable, food-filled homes and walked amongst people who have nothing. It is time that money should be no object in addressing the needs of the poor. It is time for a return to the welfare safety net, work that pays and a restriction on rising food prices. As part of End Hunger Fast, I will be fasting once a week, but Keith Hebden, Simon Cross and Scott Albrecht are fasting for the forty days of Lent. That's a pretty daunting prospect, so please do offer them your support on Twitter and Facebook. And on 4th April there will be a national day of fasting for anyone who wants to be part of this campaign. When I first heard about End Hunger Fast, I thought long and hard about joining Keith Hebden and Simon Cross in fasting for forty days and nights. Like many people I am horrified that so many individuals and families are struggling to put food on the table, due to the coalition government's appalling welfare policies. So I was immediately attracted to the idea of fasting in solidarity with people who are hungry, to raise awareness of the issues. But, after careful consideration, I realised that a) I am not mentally and physically prepared for it and b) my life is too busy to fast safely. Instead, I decided that along with a friend from church, I will join the fast once a week. And, after a further conversation with Rick from the WOW Petition - and in keeping with the original intention of this blog - I have decided to remember a victim of welfare cuts each time I do so. I was planning to begin on Friday. But on Ash Wednesday I realised since were we going away for the weekend it would be better to start immediately. This was not the wisest move. I have never fasted before, and I was not prepared at all. By mid-morning my stomach was rumbling, by lunch-time the smell of food from the work kitchen was agonisingly tempting and when I returned home from the school run, it took a supreme effort not to stuff down all the food that in my kitchen cupboards. Cooking tea was equally hard, and I thought of how many mothers must be doing this on a regular basis, skipping meals to make sure their kids are fed. As the evening wore on, I became increasingly grumpy and miserable. In fact, the only thing that kept me going was seeing how well the EHF launch had gone and knowing that I could eat soon (whereas for Simon and Keith this was just the beginning). At 11pm, I decided to break my fast. I hadn't eaten for 24 hours, and it just felt masochistic to go to bed hungry. Though, as I chomped on my two slices of toast, I reflected that many in food poverty do not have the luxury. One person who didn't have such luxury was Mark Wood who lived in Bampton, Oxfordshire (in the Prime Minister's Witney constituency). Mark had mental health needs; when Atos found him fit to work, he was left with £40/week to live on, and was unable to pay his rent or utilities bills. Last August he starved to death. According to his doctor, “He was an extremely fragile individual who was coping with life.Something pushed him or affected him in the time before he died and the only thing I can put my finger on is the pressure he felt when his benefits were removed.” In other words, the welfare "reforms" of David Cameron's government were a significant factor in the death of one of his constituents. Unlike Mark, I am one of society's lucky people. I have my health, my home and enough money to feed myself and my family. Joining End Hunger Fast is my way of expressing my outrage about what happened to him, and is happening to too many other people. Wednesday was hard, and I am not looking forward to my next fasting day. But as long as people are starving or struggling with the stress of constant hunger, it is beholden on we lucky ones to do what we can. For if we don't, who will? For further information on End Hunger Fast and to sign up to the national day of fasting on the 4th April please check out their website. If you'd like to find out more about Keith and Simon's fasts you can read about them here and here.